The Membership and Woman to Woman Committees invite you to join us for Brunch With GABWA as we nurture, support, and galvanize the power of black women attorneys. 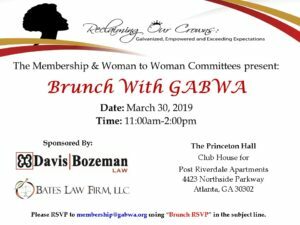 Come network with fellow GABWA members and learn more about our Woman to Woman mentor/mentee program. Please remember to renew your dues by March 31st. Not a member? Please visit our website at www.gabwa.org and join today!